The Visual Science Lab / Kirk Tuck: Reasonable and appropriate lens buying. Part two. A do-everything zoom? Nikon D610. Let me tell you exactly what I saw in shooting a couple hundred shots in the actual environment in which I'll be working tomorrow. Sharpness: Here I'm not sure what the pundits are pointing to when they say the lens isn't sharp. I found the lens to be very sharp z9cneter two thirds of frame), wide open at most focal lengths and, if you are looking for ultimate sharpness at the long end you'll get it one stop down from wide open. The niggling "gotcha" that might affect people who shoot mostly flat objects will probably be the lower sharpness in the corners and on the edges. I've shot enough samples, even of big flat trade show graphics, to see that it's not going to be a deal breaker for what I'll be shooting. And where my main trade, portraits, is involved I don't see the corners being an issue at all --- as long as the center two thirds of the frame is nice and sharp and contrasty ---which it is. Features: There are a couple of reasons I like this lens and am considering it for tomorrow's job; if not also for the second job this week. One is the fact that it's a constant aperture f4.0. That usable f-stop, in conjunction with the high ISO performance of the D610s means I'll be able to shoot the entire assignment with just one camera and lens and a (wooden) monopod. A truly efficient and highly portable way of working. The lens also features Nikon's latest VR which should give me about three stops of vibration reduction. That and the monopod means sharp images throughout the show. Any faster of an aperture and I'd have issues with limited depth of field. The most valuable feature, besides the long range of focal lengths, is the relatively light weight. Light weight? Well yes. My alternative if not using this lens would be to shoot with the Nikon 24-85mm G f3.5-4.5 lens and the 80-200mm f2.8 lens. The combination is heavier and bulkier and I would lose the VR at the longer focal lengths, and that's where I need VR the most. Finally, I think I'll be a big fan of the Nano Crystal coating on the lens because there are lights everywhere at the venue and my tests showed the lens is fairly good at flare resistance. I'm pretty much decided on using the Nikon gear tomorrow. But the jury in my brain is still in recess when it comes to camera and lens choices for Thurs., Fri., and Saturday's shoot. It's a toss up between the small size and low weight of the m4:3 system or the "one lens to rule them" idea of the Nikon system. It's a two camera, two lens system with m4:3 (EM5-2s and the 12-35mm f2.8 + 40-150mm lenses) versus a Nikon D810, the 24-120mm and a bit of "cheating" by switching the big camera to the forced DX setting when the need for tightly cropped speaker shots arises. There are fun trade-offs to both choices. I'm just thinking out loud here and showing you what my thought processes are when I sit down to plan out what I'll be shooting with for any particular job. I am confident I could do either job with either system. Right now I'm leaning toward the Nikons because the new lens is still a novelty. We'll see if the "new lens smell" has worn off by tomorrow. So far though I am happy with both of my recent lens acquisitions as they both fill gaps in my systems for certain kinds of work. Medici Coffee House before the event? Makes me wish Olympus would deliver a mFT version of the "legendary" (well, maybe not quite) 24-120 mm-equiv F4.0 built for the E-mount Olys. I still use the four-thirds 14-54, wish the made a native m43 version. (Or per Peters comment, a native 12-60). I've owned 2 Nikon DX format cameras since August 2007. I've been waiting for wide to normal primes for the DX cameras as well as a good general purpose zoom. I finally bought a used 16mm-85mm 3.5-5.6 zoom. Not the best by far but it will have to do. In the end I went and bought a Fujifilm XPro-1, again used. Added a 27mm 2.8 to the camera and now have been enjoying photography all over again. When a year of shooting is up, March '16, I will look at adding a wide angle prime and a general purpose zoom. But right now the 27mm is a whole lot of fun. Did you consider the Sigma 24-105 art lens at all Kirk? Looks like I'm not the only one - my old Olympus 14-54 is still going. If either Oly or Panasonic would make something similar for m4/3 I'd stand in line for it. 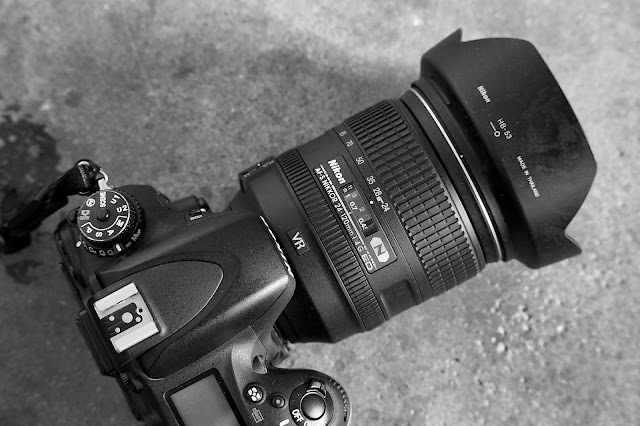 The 24-120 is #1 on my lens lust list right now. Not a glamor lens, but it should do what I want very well. It was a stretch of the budget when I bought the used D800. My one modern lens is the 24-85 - discovered thanks to your blog and bought half-price refurbished thanks to eBay. I'm happy enough with the lens for what I do, mostly people and portraits, but I sure would love to have the extra length of the 24-120 for tight headshots. Sometimes I wish you wouldn't write about the stuff I want. I have the latest version of both of the lenses under consideration and I prefer the 24-120 over the 40-150. The 24-120 is a great match for the D800E a heavy walk around, and all purpose shooter. I bought an Olympus OMD e-10 with the two kit lenses in a package deal (the 40-150 was free). I tested it against the Lumix 40-150 (it also came free with a G5 kit), both are okay but the Lumix feels better in use. I did buy an Olympus 12-40 for the OM 10 and this lens has not come off the body since purchase, much much better. I also have a 14-54 II that I used with the Panasonic adapter and that is also a good lens but the focus is slow. The best of the 4/3 m4/3 lenses that I own is the 50mm Olympus Macro, just superb wide open at f2. My two pennies say go with the Nikon and the 24-120, I choose Nikon on the rare occasion that I get paid to shoot so I suffer the weight of my equipment but I return home with files that will not run out of headroom. Like you, I shoot quite a few corporate events, and buying the 24-120/4 lens has been one of the better things I've ever done when it comes to turning a two-camera shoot into a one camera shoot. I'm not getting any younger, and any day I can roll with a single D750 and this lens instead of a pair of those bodies with a 24-70/2.8 on one and a 70-200/2.8 on the other is a good day when it comes to fatigue. I don't find the f4 maximum aperture to be a problem, and I routinely shoot in extremely low light levels. I'm not shooting architectural interiors on these jobs, and to my clients, more depth of field is better. I consider this lens to be one of the unsung heros of the Nikon line-up. from Dallas Texas! Just wanted to tell you keep up the good job!